Apple's initial ad campaign for the new iPad mini simply presented it next to the full size iPad both playing a duet in GarageBand, or alone in a user's hand to highlight its smaller size. 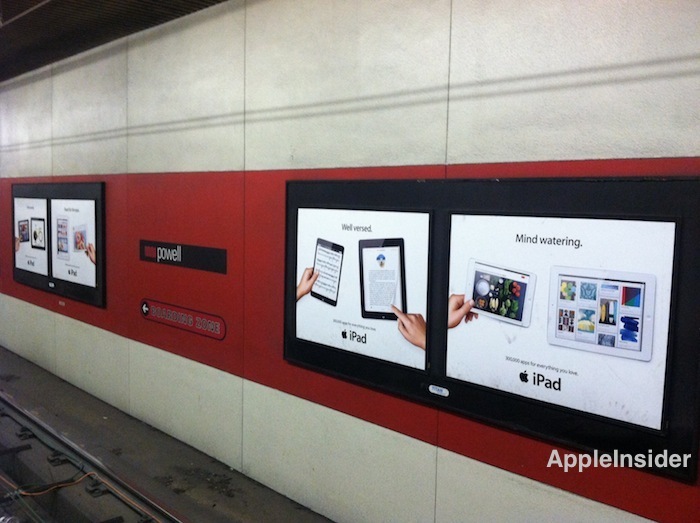 The new ads present both a full size iPad and iPad mini, depicting both running one of a series of creative applications. 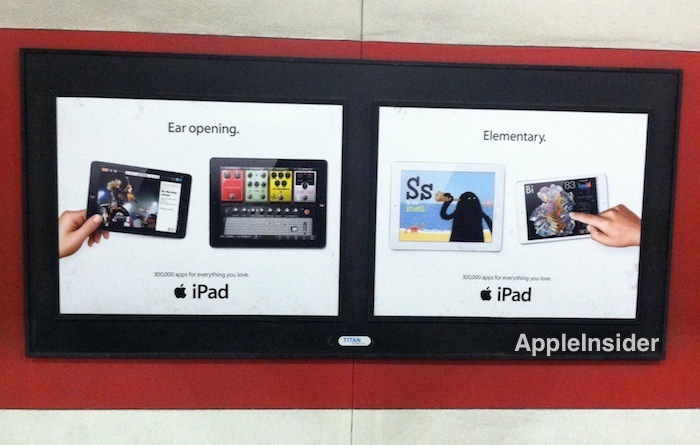 Each ad has a simple headline that highlights a particular category or type of apps, such as "Ear Opening" for music related titles, "Elementary" for educational titles, "Well Versed" for music notation and ebooks and "Mind watering" for visually graphic apps. The new ads draw attention to Apple's strong software lead ahead of Android, Windows Phone, Samsung's Bada, BlackBerry and other mobile platforms. While Apple's iPhone and iPad ads have focused on their functionality, ad from Samsung have typically portrayed the company's Galaxy products as capable of depicting a dandelion or similar static image, or call attention to hardware features such as the Note's bundled stylus to scribble on top of a static image. Other Android products are typically pictured in advertising at their home page of icons similar to the iPhone. Amazon's recent Kindle Fire HD ads portray the device alongside an iPad, with both swiping through a series of static photos rather than running any actual software. The spot then asks viewers if, based on looking at a static display of images, they notice a difference in the two apart from their price. Steve Jobs took a harsher tone in deriding competing tablets' scant app capabilities, noting at the release of iPad 2, just after the debut of Google's Android 3.0 Honeycomb, that there were "at most 100 apps" for it. In reality there were only about 17. At the time, Jobs could boast 350,000 App Store titles, 65,000 of which were optimized to "take full advantage of the iPad," drawing attention to "consumption apps, creation apps and fantastic games, and a lot of apps for business and vertical markets apps like medical. The things people are doing here are amazing," he said. 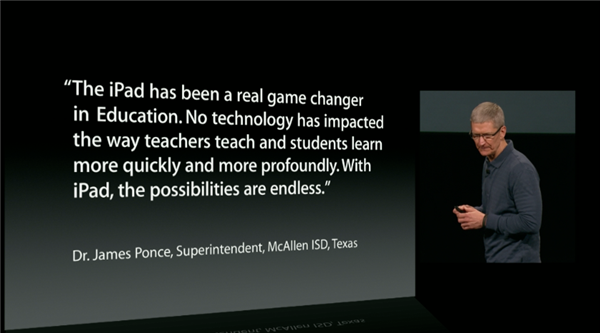 Today there are over 775,000 App Store titles, 300,000 of which are specific to iPad. 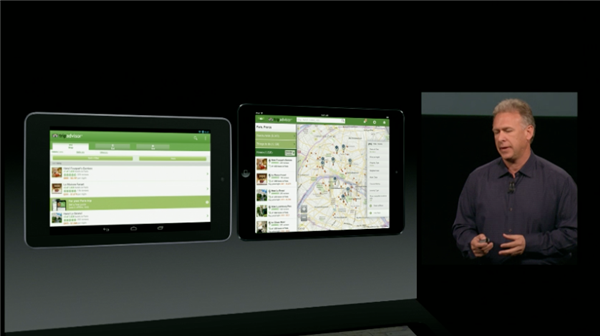 At the launch of iPad 4 and iPad mini last October, Apple's head of product marketing Phil Schiller drew special attention to the "night and day" difference between tablet-optimized iPad apps and the stretched smartphone apps that work on Android tablets (above, TripAdvisor on both).